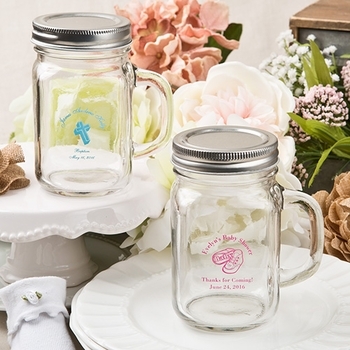 Add to the fun of your next get together with these classic Mason jar glasses. Tailor to your occasion with the color, design, and wording you would like. Great as a beverage glass or to fill with treats, each jar holds 12 ounces and includes a screw-on metal lid. Clear glass with a thick sturdy handle, each will arrive with your design choices professionally silk screened on the side. They really add style to your party decor and can be taken home by guests as a keepsake of your special event! Minimum order is 20. Shipped in bulk - not packaged individually. Free shipping is included. My guests really liked these! I ordered these for my baby's communion and everyone oohed and aahed over them! I filled them with candies that everyone loved. ProsThey are practical and unique. Good for a co-ed event of any kind. Please read the description under the photo before designing your glasses or jars.